The frosh pitcher turns in a calm yet dominating performance, tossing the first known perfecto in school history. PASADENA.–Her toddler niece had precious little interest in the game taking place on the softball field Thursday, climbing the spectator benches and playing with a sparkly charm. Everyone else at Westridge School, however, was riveted by what Hailey Yoshida was doing on the diamond, an event that turned out to be one truly for the history books. 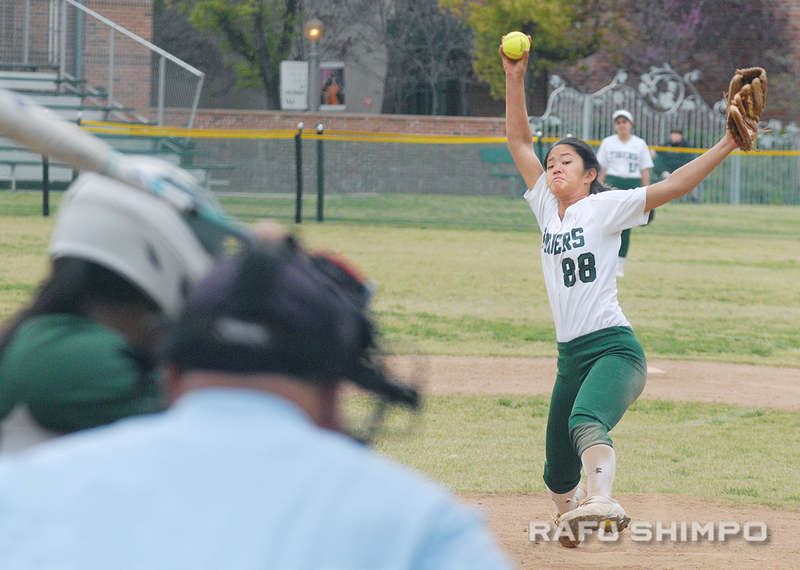 The frosh pitcher went about her work in the circle, focused and calm – occasionally flashing a shy smile – and was completely dominant, throwing what is likely the first perfect game in school history, a 7-0 masterpiece over visiting Providence. With a rise ball that handcuffed the opposing batters and a changeup like molasses staggering into a headwind, Yoshida struck out 17 of the 21 hitters she faced, without allowing any to reach base. “I wasn’t really paying attention to the outs or the hitting, so maybe it wasn’t until the fourth inning that I realized something was going on,” Yoshida said afterwards. In keeping with baseball tradition – or superstition – no one on her team mentioned the fact that she was working on a no-hitter. The only real threat to Yoshida’s gem came with one out in the seventh and final inning, when a sharp grounder toward third base was snared and the runner thrown out at first. Westridge athletic director Melanie Horn confirmed that there hasn’t been a perfect game for the school in at least 20 years, but was unsure if one had been thrown before then. No-hitters are somewhat more common in softball than in baseball, with shorter games and smaller dimensions, but Yoshida’s performance was something singularly impressive. She threw only 80 pitches in the game – averaging 11 per inning – 62 of which were strikes. She reached a three-ball count only twice and improved her season record to 3-1. All but one Providence batter became a strikeout victim, with the Pioneers’ second hitter fanned three times. 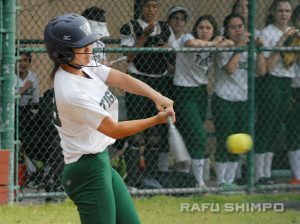 Yoshida also helped herself at the plate, going 2-for-4 with an RBI single in the sixth and an error-aided run all the way around the bases. The victory also keeps Westridge in the mix for the Prep League title. They improve their league record to 5-4, sitting in sit in fourth place behind Polytechnic (9-0). Not a bad way to rebound from a loss earlier in the week to Poly – and to add a little more joy to her upcoming 15th birthday. Those on hand to witness history included several members of Yoshida’s family, including her mother, Stacey, grandparents and her uncle, Ryan. Not present, however, was Yoshida’s father, Ross, a staff member at Dodger Stadium who couldn’t slip away for the afternoon game. He was, however, keeping track online, and said he was able to retain his composure in the office. “I was pretty calm. The kid doesn’t surprise me anymore,” he said, describing the progress his daughter has made over the last couple of years. Last year, Yoshida joined the Cal A’s, the travel ball club that has helped to develop players including Biola’s outstanding frosh pitcher-outfielder Jennifer Morinishi. While the rise ball was all but untouchable for Providence, it was the syrupy change that elicited oohs and aahs from observers. That is the pitch, though, that both father Ross and uncle Ryan report as Yoshida’s weakest point. “That’s her worst pitch,” Ross explained. “She doesn’t have confidence in it yet. 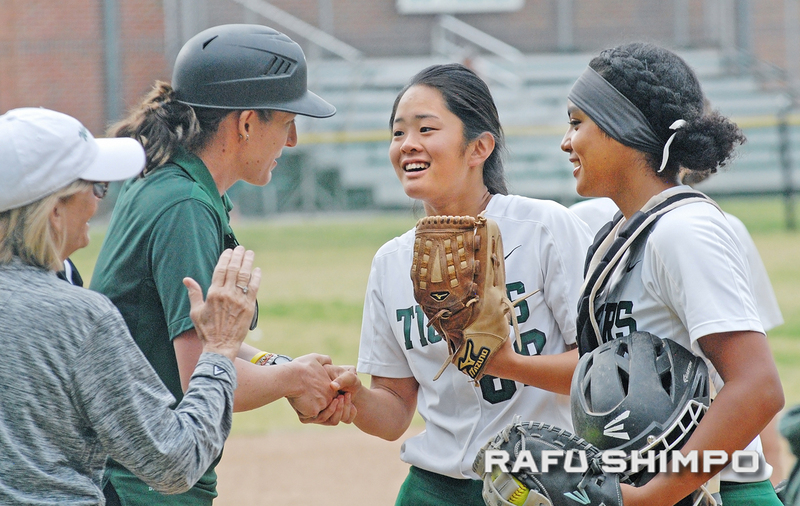 Calling her young pitcher “super modest” and “ridiculously coachable,” Westridge head coach Karen Hanselman said one particular slow ball Yoshida threw was a highlight of the game. “I wanted to eat that changeup, that was so pretty,” Hanselman said. 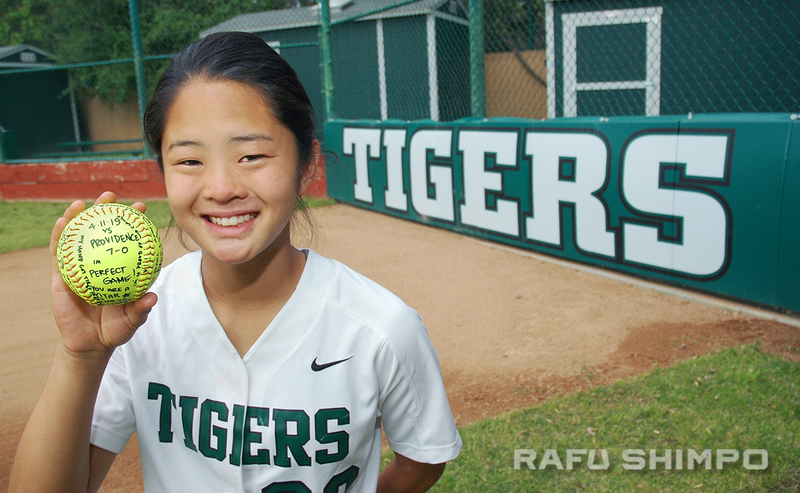 Yoshida is expected to pitch on Tuesday, when the Tigers host second-place Chadwick at 3:30. It stands to reason that Yoshida is developing into a skilled all-around athlete. Having played youth basketball and practiced Kyokushin karate, she comes from good stock; her mother was a basketball standout at Cal State L.A., Dad played baseball and Uncle Ryan is a former star linebacker at Culver City High. “I can’t wait to watch her grow and keep getting better,” Ryan added. Still, after Thursday’s sterling performance, she was mentally analyzing, still looking for points that needed work. “There’s always improvement to be made,” she said. For opposing teams, that’s a daunting notion indeed.